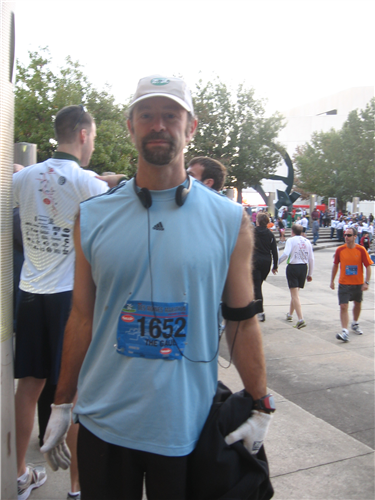 This is going to be a retro-post and I certainly haven't run the Des Moines marathon recently, but in fact, I did run it in 2010 as my 3rd marathon. I was training with my group, Crystal Lake Health Bridge Road Runners that fall and was trying to figure out what marathon to do. Most of the group was doing Chicago and I already had Vegas on the radar. I definitely wanted to take advantage of my marathon-ready fitness and give a race a go. It was a toss-up between Des Moines and Grand Rapids. I had never been to Des Moines, let alone Iowa, despite living in Illinois for the greater part of 20 years. I just never had a reason to go there before. I was a bit impulsive and didn't check to see how far Des Moines was. I figured, it was three hours or so (turns out it was over 5) and I signed up before realizing my error. I also got on their website, found a hotel within walking distance of the race start and without checking a site like Trip Advisor. Heck what could go wrong with a hotel downtown in the heart of Des Moines? The ride there wasn't terribly exciting. I've driven through Iowa 3 times now and while people claim Nebraska is a super boring drive, I am willing to say Iowa is worse. Shari and I took off Saturday morning, got my t-shirt at the expo and goodie bag and checked in the hotel -- and that is where the fun started. The hotel was old. I am not going to mention which one it was, but the lobby was something out of a black and white movie. A vintage elevator (only thing missing was an elevator man), check-in desk, brass / gold trim, etc. It was clean but it certainly had a musty, old smell. I didn't think it was that bad, but Shari immediately was throwing a fit. We checked into the room and while it was small, it was clean and the bed was reasonably comfortable. Shari was getting irritated by the smell and was worried about "ghosts" and spiders. It certainly had an old people's smell about the place and the furniture was something out of the 50's. I have pictures of the room somewhere and they are worth a laugh. Shari was urging me to get into a different hotel, but with the marathon in town, it was good-luck with that. Also the other hotels were certainly more expensive. She called the front desk and asked, "Do you have any rooms that don't smell like old people?" The perplexed hotel operator replied back, simply, "No they all smell old." I still laugh at her for doing that. Our first trip then was to Walgreens where we bought a can of air freshener and Shari used it liberally to spray the poor room throughout the night. I slept comfortably -- well as comfortable as one can before a marathon. 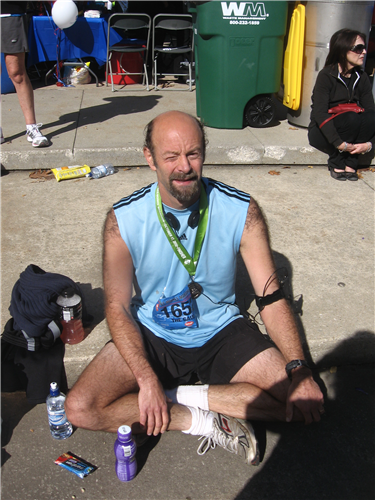 For those who have run one before, sleeping before a marathon is generally fitful at best. For those interested in the course, the first half or so is deceptively hilly. There was only one major hill but there were plenty of ups and downs. Also, the race had 7777 runners, if I remember correctly, so the first mile or two, before the half splits from the full was crowded. You start in the downtown area before heading to a residential area with stately mansions. The governor's mansion was also cool to see with it's golden top. There were plenty of curious people checking out the scene and you get to run through Drake Stadium where many famous track meets have been held. I was feeling pretty good despite the growing heat. After about 15 miles you get to go through several parks / forest preserve type of places before heading back into town. The heat hammered me pretty good and by mile 23 - 24 my pace had slowed considerably. 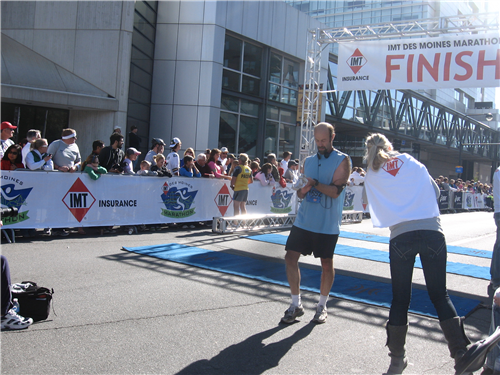 I did finish in 3:39:38, which at the time was my personal best. I would highly recommend this marathon. Everything about it was well run and I enjoyed the course as it offered a variety of terrain. Also the post race food was probably the best I've had at any major race. Also, out of all my shirts, this is my favorite, as it has a cool map on the back with major highlights of the course and clearly indicates I ran 26 miles. So even if my memory has faded a bit, I can look at the map and recall how I felt and the funny hotel situation.